It's been an outrageously busy couple of weeks, so we've made no progress inside. 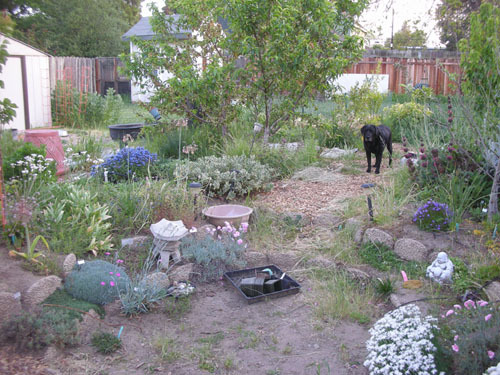 But we also had a couple days of blisteringly hot weather, and that brought out the blooms in the garden. I think the plants all think it's June and time to get ready for the heat of summer. I've been so busy that literally NOTHING has been done in the garden. 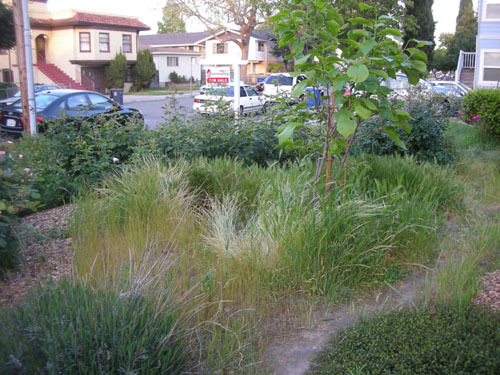 So while it's in the finest bloom, it's also overrun with grass and other weeds. 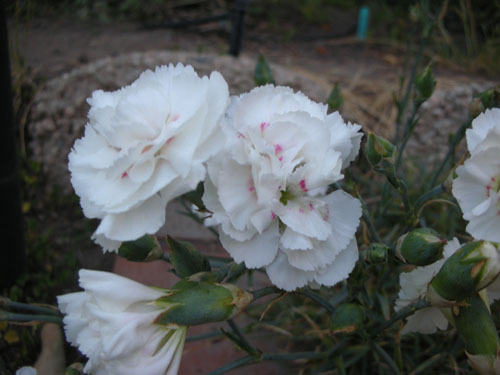 All the dianthus are looking good. 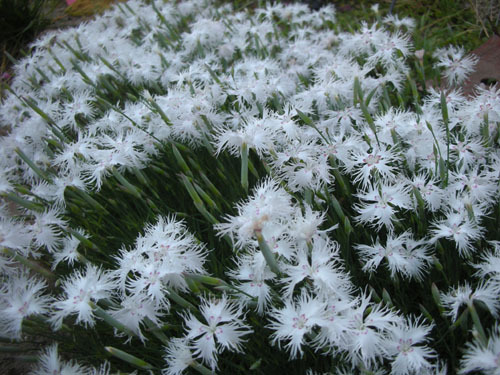 A classic flower for dry summers, and a great way of covering ground. 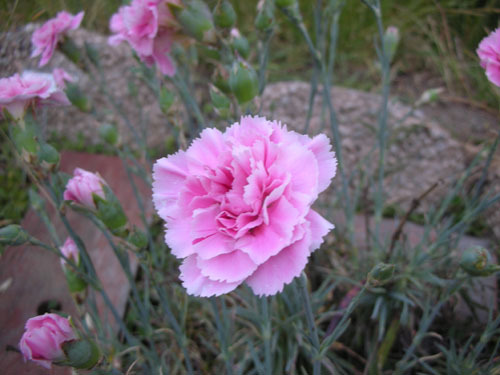 This is a more traditional carnation (also a dianthus, also known as a pink because the edges of the petals look like they've been pinked: trimmed with pinking shears). I got that pink and this white one at the same time, unmarked at a local nursery. I can be kind of a plant name junkie at times, and I like to get some plants that I don't know exactly just to keep it under control. 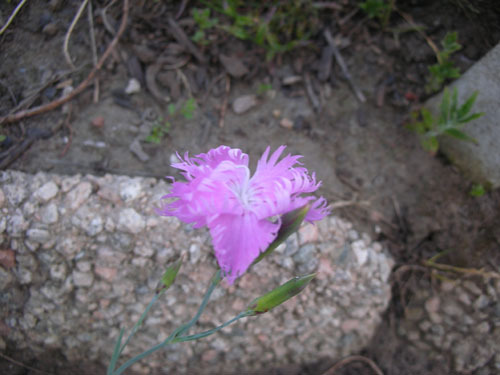 And this one I definitely don't know the name of, because it's a seedling, off my 'Firewitch' dianthus. I think I will let it grow for a season and move it to a more useful location. 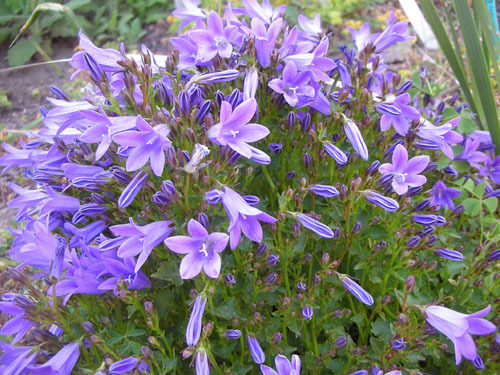 Another unnamed plant is this campanula. It came in a little pot at Trader Joe's. While campanulas with more documented provenance have curled up and died, this little guy soldiers on. That is not usually the result I get from grocery-store plants, so it's a nice change. And here's my Iris nelsonii (all that un-identified plant stuff was making me antsy). That plant is spreading slowly across the back of the daylily bed. 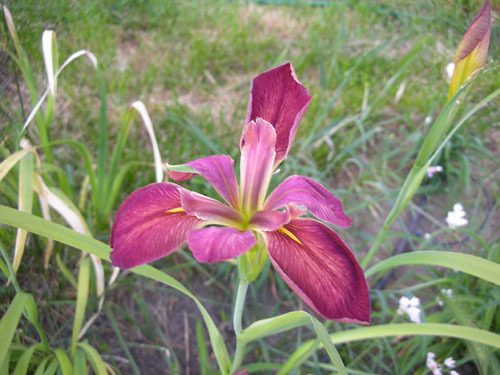 Since the daylilies are in desperate need of dividing, I'm thinking this iris will get split up at the same time. I was unsure it would thrive, because it prefers marshy land (which we really do not have), but apparently it's just fine with well-drained sand. For Steph, another shot of the ladybug poppies. You can get them from Annie's Annuals, either in their nursery or mail order (or sometimes you find the plant you wanted at a local nursery). The funny thing is that there are two identical plants there. One going crazy, the other looking a little sad. I think the invasive ferns are bothering the smaller guy. 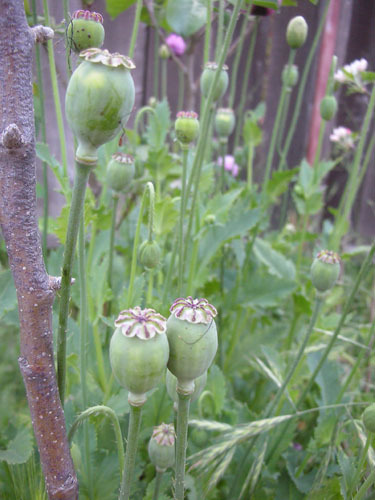 And here are some of the poppies in the orchard. They are engulfing the dwarf apple trees, which have just started putting out leaves and flowers. 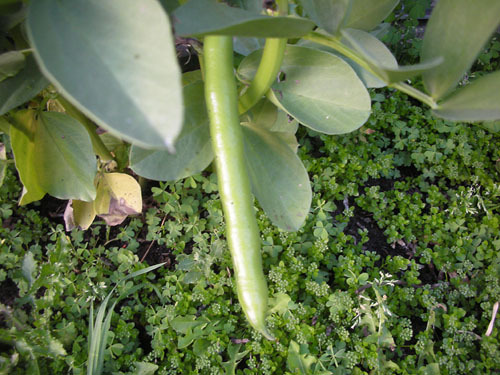 Another seed pod that started appearing this week is the fava beans. Yes, that is a ridiculous number of weeds at their feet. I should see how I can tell when these are ready. And here's my pink ceanothus ('Marie Simon'). People actually call this a California lilac, which is a total misunderstanding of what a lilac is. 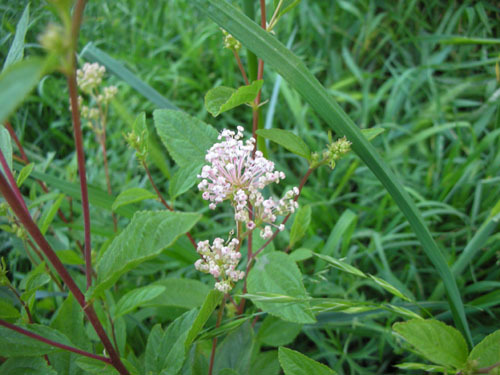 It's a pretty flower, and a very nice bush, and deserves to be admired on its own merits. They're notoriously hard to grow East of the Rockies because they don't like water in the summer, and keel over dead from rot. 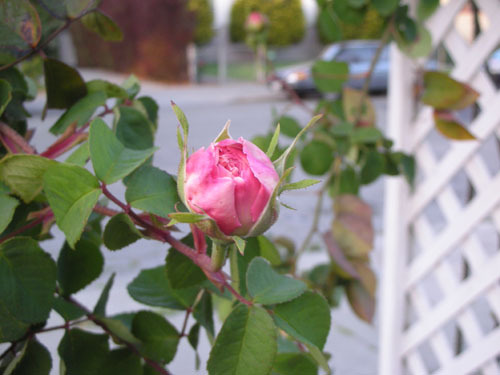 The big development this week is that the rose hedge has started blooming. I saw buds last week and knew it would be along soon, but in the last couple of days the flowers have started really opening and making a show. I like this stage because mildew and black spot have not yet set in and started making the bushes look ragged. And here we have the arch, responding nicely to the pruning I gave it this winter. 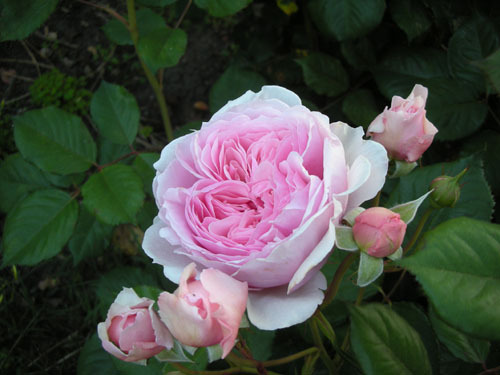 Roses generally bloom on horizontal branches, which is why it's kind of looking like it got a funny side haircut. Lest you think it's all looking great out front, check out how bad the area around the magnolia has gotten. I suppose it would not kill me to drag the mower over there once in a while, right? I'd like to put down pavers and have a little front patio there for sitting on summer evenings and gabbing with the neighbors. But that might require some real grading work which I'm not prepared to do right now. 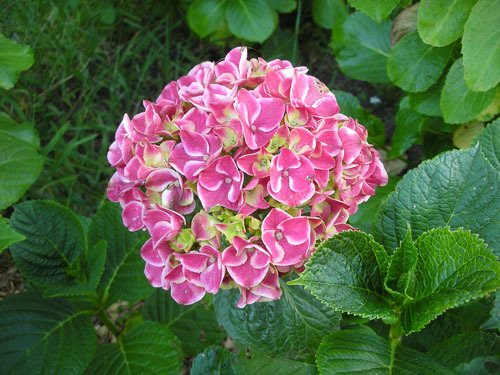 And last of all, the hydrangeas are blooming. Admittedly, they have only the briefest of deciduous periods in this climate, but I like their big poufy bracts. This is 'Harlequin,' very pink because of the foundation replacement work (concrete leaches into the soil, shifting the pH near it upwards, so plants near a concrete foundation must not require acid soil). 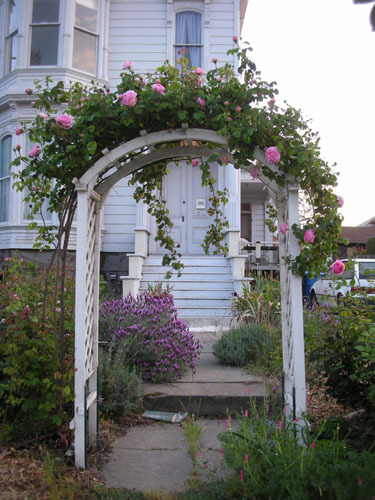 Love the blooming arbor! 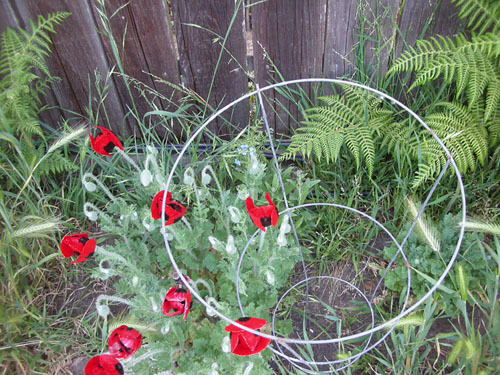 And the ladybug poppies are beautiful. My marie simon calif. lilac, was a gift from Oregon, every time I set it out (Sacramento area) it's leaves wilt. Do I just need to climatize it? or keep watering it? Chelsea, you may just need to harden it off -- get it used to your surface-of-the-sun temperatures out there in the valley. Ceanothus in general don't care for too much water, especially in the summer, so don't water it too much. It could also not be liking being in a pot, and might be a bit root-bound. Sorry to take so long to respond to this, but I wanted to ask a couple native plant experts just to be sure I was on the right track. I'm writing from Australia; have been reading your archives for the past week and found them totally fascinating. Hubby and I are renovating a house built in 1920, also decrepit when purchased; now partly restored. Looking at your dining room after the demolition party I came to the conclusion our home was not as bad as I thought. Like you say, your house has good bones. Your garden is a credit to you. I love your garden posts. After 3 years without a garden I am finally getting my hands back into the soil, and it feels goood! Anyway, I just wanted to say I am suffering from bean envy, and did you know you can eat bean and pods while the pods are young. Just slice them. BTW I also envy you your pantry. Well done! My mother in law has a beautiful lilac bush (Tracy, CA). I think she moved it from when they lived in Pacifica. I'm not sure what "kind" it is but it has med-dark purple blooms.